This volume examines the nature, function, development and epistemological assumptions of the legal case in an interdisciplinary context. 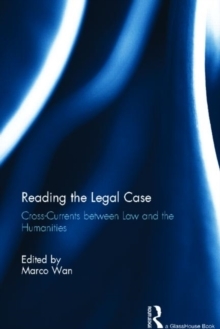 Using the question of `reading' as a guiding principle, it opens up new ways of understanding case law and the doctrine of precedent by bringing the law into dialogue with the humanities. What happens when a legal case is read not only by lawyers, but by literary critics, by linguists, by philosophers, or by historians? How do film makers and writers adapt and transform legal cases in their work? How might one interpret fiction in the context of the historical development of the common law? The essays in this volume test the boundaries of the legal case as a genre by inviting perspectives from other disciplines, and in doing so also raise more fundamental questions of what constitutes law and legal thinking. This book will be of interest to anyone seeking a better understanding of the common law, the humanities, and the intersection between them.